Trea Bertie leaves the pitch to be replaced by Adam Knight after scoring twice in Racers' win over Hinckley AFC. Lewis Hayden added a fifth for the hosts who were in control for the majority of the fixture bar for a sloppy period in the ten minutes before half-time during which David Jones pulled a goal back for the visitors. George Curry, Jack Cresswell and Scott Turner all had efforts off target before Hinckley keeper Jinka Adebowale was forced into his first action of the night in the 14th minute, producing a strong hand to keep out a driven shot from Ben Mackey. He was powerless, however, to prevent Bertie’s follow-up from the edge of the box hitting the back of the net. 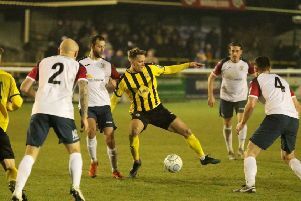 Mackey was proving a handful for the visitors and the former Leamington striker earned a dangerous free-kick on the edge of the box which Curry curled over the bar. The recent signing was not so wasteful with his second dead-ball attempt, however, taking advantage of the generous gap left by Adebowale to curl the ball over the wall and past his despairing dive to double Racers’ lead. Adebowale gathered a Chris Johnston effort at the second attempt with Hayden lurking and it appeared too easy for the home side as the game drifted towards half-time. The visitors were then handed a lifeline when Charlie Bannister’s clearance was picked up by Jones who produced a neat flick to get past his marker before curling the ball home from 25 yards past the wrongfooted home keeper. The goal gave Hinckley renewed belief but this quickly evaporated after the break when Jean Dakouri received his marching orders. The combative midfielder had not long since been issued with a yellow card for persistent fouling when he caught Mackey late, earning a second caution. To compound the visitors’ misery, Curry curled the resultant free-kick over the wall from the angle of the box and into the far corner. 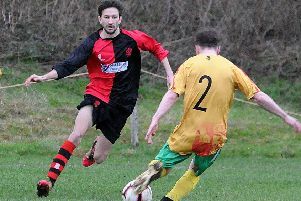 Sean Castleton put a free header over the bar and Mackey fired past the near post as Racers looked to turn the screw and a fourth came in the 66th minute. Hayden’s mazy dribble took him into the box and as he lost his footing he managed to nudge the ball to Bertie who swept it home. Substitute Adam Knight shot across the face of goal, while Bannister stood up well to deny Grant Ryan in a rare attack from the visitors before Hayden added the fifth five minutes from time, sliding the ball past Adebowale after he looked to have been crowded out in the box.